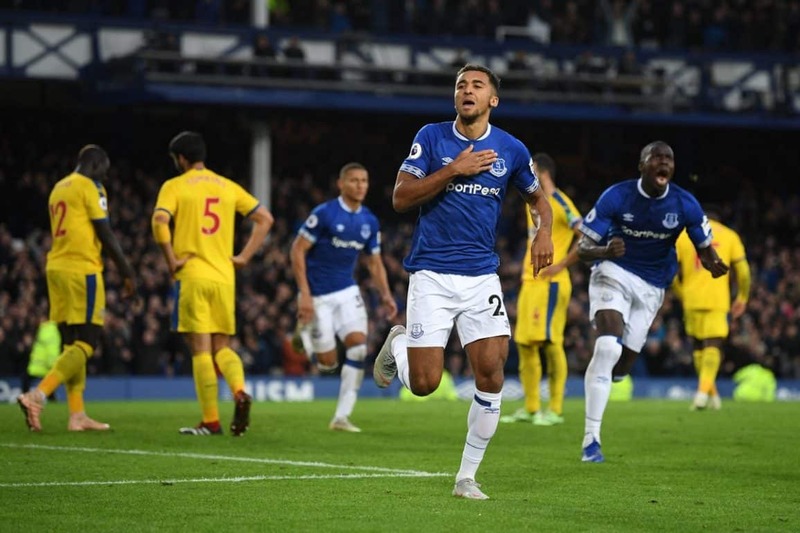 A superb penalty save from Jordan Pickford proved crucial as Everton built on it to secure another three points on superb finishes from substitutes Dominic Calvert-Lewin and Cenk Tosun. Opposite number Roy Hodgson had a doubt over the availability of Wilfried Zaha but noted on Friday, “My information is that he hadn’t trained with us since the injury but they’re hoping he’ll train tomorrow and if he does, I guess he’ll be available to play.” The 71-year old also came north having only ever recorded one point as a manager against Everton at Goodison, and that with Blackburn, but looking to mastermind a 100th Premier League victory for the South London outfit. Marco Silva selected his starting line-up: Pickford, Digne, Zouma, Keane, Coleman (c), Gana Gueye, Gomes, Sigurdsson, Walcott, Richarlison and Bernard. Roy Hodgson named his eleven: Hennessey, wan-Bissaka, Tomkins, Sakho, van Aanholt, McArthur, Kouyate, Milivojevic (c), Schlupp, Townsend and Zaha. After pre-match rain, kick off came in lovely autumnal sunshine where our referee was Anthony Taylor. A lively opening to the first half saw Seamus Coleman have a quiet word with referee Taylor after two robust challenges on him by Schlupp and Kouyate and fast counter by the Blues that broke down on the edge of the Palace box. Debutant Andre Gomes was showing a clear intent to impress and was involved right from the start. On nine minutes Bernard, who’d lost his footing a couple of times on the slick pitch, cut in off the left to find Coleman, but his rising shot cleared the crossbar. 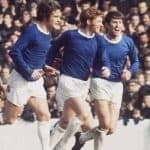 There had been a few tough tackles and the Goodison crowd howled when Richarlison went down under a challenge from Tomkins trying to make the most of a long ball from Pickford. Moments later, Richarlisin gained the ball in midfield and broke in but Tomkins denied him with a perfectly timed tackle. The ‘robust’ challenges continued in an otherwise entertaining session as Tomkins floored Richarlison from behind but escaped any punishment. Palace had weathered the early Everton attacks but had Hennessey to thank on 27 minutes as Sigurdsson found Coleman in space on the right the the captains cut-back saw Hennessey turn Sigurdssons first time effort for the top corner away for a corner. Gana Gueye was booked as Palace looked to break away after clearing the resulting corner kick. Pickford showed why he’s Englands’ a Number One with a superb save to deny Palace from a right wing corner. Richarlison put a header from a Digne corner just too high and right on the half time break, Gomes found Gana Gueye to play in Sigurdsson, but his curling shot beat both Hennessey and the post. Competitive and physical at times, the game was in need of a touch more quality. No changes by either side during the break and Everton showed their intent, winning two early corners. Milivojevic was booked after five minutes of the half for an agricultural tackle on Richarlison in midfield as the Brazilian looked to counter at pace. Sigurdsson winning the ball in a midfield tackle fed Gomes who played Walcott into the box with a superb pass, but Hennessey dealt easily with the cross. Palace were awarded a 58th minute penalty as Zaha went down under a challenge from Coleman and referee Taylor had no hesitation in pointing to the spot. Milivojevic stepped up to hammer the kick, but Jordan Pickford stuck out a leg and saved it to rapturous cheers from the Goodison faithful. Sigurdsson played a delightful through ball for Walcott but this time it was Hennessey with the big save with his legs. Richarlison did likewise for Bernard, but his fellow countryman overplayed the ball and the chance disappeared, and on 65 minutes Cenk Tosun duly replaced Bernard. Walcott down the right cut the ball back to Gomes who checked inside and curled a shot just wide of the far post. Into the final ten minutes and Coleman was booked for a foul on Zaha ahead of a crucial double change by Marco Silva – DCL coming on for the very impressive Gomes and Ademola Lookmam replacing Walcott. The changes paid huge dividends as five minutes later, Richarlison found Lookman and his neatly chipped cross was powered in by DCL to break the deadlock. Two minutes later and a marvellous ball out of defence from Michael Keane released Cenk Tosun and the Turkish hit man took his time before beating Hennessey for two-nil. A very good performance all round from the Blues in a game that was always competitive, with my two candidates for Man of the Match being Andre Gomes and a quite outstanding performance from Michael Keane.